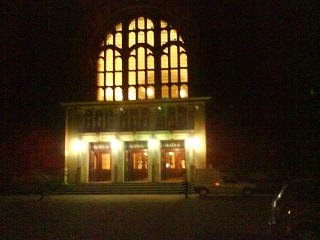 Squashblog will return in January. 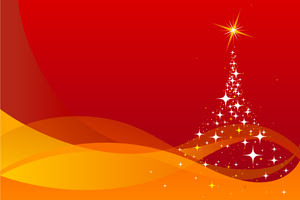 Look out for postings in the new year as the site moves into its second year of existence. 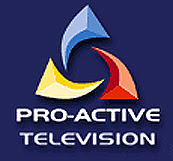 I wrote previously about Pro-Active TV's videos for the PSA tour. Palmer and Shabana talk about being double World Champions before during the recent World Open in Bermuda. Linda Davie and Peter Lawrence explain the 3 ref system of officiating at the Canary Wharf Classic. How about commissioning Pro-Active to produce the next Olympic pitch? 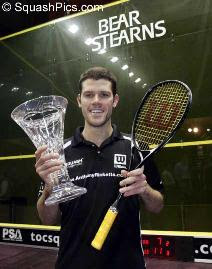 The Australian professional Anthony Ricketts has retired from the PSA tour. The 29 year-old from Sydney has had a number of injuries in the past few years, and has decided that the damage to his right knee is such that he cannot regain the fitness required to compete at the top level. 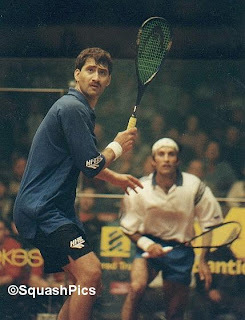 After that I was lucky enough to then see Ricketts in more events in Britain, and broadly agree with the sentiments expressed by others in the squash community when summing up his career and qualities as a player: he was a committed professional, a tough competitor who gave his all and was magnanimous in victory and generous in defeat. However, to the spectator who wasn't used to his demeanour, he could be difficult to read and for this reason I didn't find him particularly endearing the first couple of times I saw him. I was soon able to appreciate the often incredulous (sometimes hilariously faux histrionic) challenging of the officials for what it was: rather than seeking to rile the officals or gain any kind of unfair advantage over his opponent, Ricketts was obviously a proud, professional sportsman who simply wanted to be treated as such. "This is a big moment for me, I’ve been waiting for this for a long time"
When an athlete has to retire through injury, they approach a new phase of their life knowing that they will almost never be able to return to professional competition. Few would have begrudged Ricketts his British Open win in 2005 (pictured) and another major win the same year in the Tournament of Champions in New York - the big titles his talent deserved had come at last. The Super Series of 2006, when Ricketts played Lee Beachill in the final, made me revisit my ambivalence about the way Ricketts behaved on court, when the Australian asked for the ball to be changed when clearly in trouble against the Englishman. This upset Beachill, who subsequently lost, and I left fuming that Lee had been robbed by the actions of Ricketts, whom I felt may have acted within the rules of the game, but not necessarily in its spirit. ultimately culpable as they didn't appear to have a grasp of the Super Series rules. The right of both players - and the paying spectators - to have a game properly officiated outweighed any individual grievances generated in the heat of the moment, and it showed Ricketts as a passionate advocate of a more professional tour (an opinion also voiced by fellow Australian David Palmer throughout his career). Whoever was responsible on that particular evening, it wasn't a good advert for squash. Ricketts probably would have won a lot more singles titles if injury had not plagued his years at the top. He also had an illustrious doubles career, partnering Stewart Boswell for the most part when representing his country (see the doubles wins below. I also wondered why he never paired up with Palmer ...). In recent years, I haven't been able to open a squash magazine without seeing Ricketts splashed across the page as the face of his sponsors Wilson, appearing in promotional material for their ranges of rackets. It appears that they had a successful relationship, and comments from Wilson suggest that the relationship may continue. Australia could have done with Ricketts in the (just ended) World Team Championships. Aussies seem to relish team events and Ricketts must be just the sort of guy you would like to have around a squad. The phrase "hard but fair" is often misapplied, but Ricketts - who was always first to offer his hand to an opponent, win or lose - seemed like a decent bloke who cared that things should be done properly. His retirement means that the PSA has lost one of its strongest adverts for the increased professionalism that the sport aspires to. Poor old footy fans stuck for something to do next summer have been given a sensible suggestion by Auntie Beeb. After all home nations were knocked out of Euro 2008, the BBC has sought to lift sports fans' spirits by offering 10 alternative ideas for what to do over the summer. 7. Watch other sports. Who needs Euro 2008 when there's Lewis Hamilton storming through his second Formula One season, a Rugby League World Cup and an England Test series against New Zealand? The Olympics in Beijing will be just round the corner, starting with football on 6 August, and the squash world championships in Manchester in October will showcase top British talent such as Nick Matthew and Tania Bailey. And plenty more British (and world) talent will be on show besides. As many of the England football team's players are based in the north-west, what better way to round off a long, boring summer than to get themselves down to Sportcity? Er ... well, I can't be sure for certain. But as the clip looks like it was taken from the abc channel in the US, it therefore appears to have been broadcast, so it is unlikely to have resulted in injury. Click either here or on the photo to see the film (opens in new window). 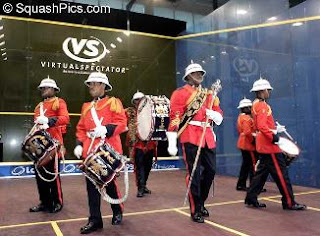 The Men's World Team Squash Championships 2007 - currently approaching the knockout stages in Chennai, India - are an incongruous affair for the squash fan. The strength of competition at the top of the men’s game means that the eventual winners cannot safely be predicted. However, we almost certainly can say which four countries will provide the semi-finalists: England, Egypt, Australia and France. I wasn't aware that Jonathan Power was still available to be selected for his country after his retirement - I had read that he had participated in the Canadian Nationals, but thought we had seen the last of him in overseas events. The dominance of the nations mentioned above means that his form will only really be assessed when he meets a top ten player - probably in the quarter finals. 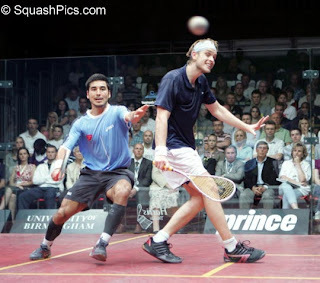 I last saw Power compete in the Super Series of 2005, where he took Lincou apart 3-0 in one of the most emphatic games of squash I've ever seen. The Frenchman will be glad to see that Power is in the other half of the draw this time. Whether Power can motivate his team to upset the seedings will depend on him beating (probably) David Palmer in the last eight. The Australian has been in great form, and there will be massive pressure on him to avoid losing to a player who has come out of retirement (even if his opponent is one of the greatest players of all time). Focussing on an individual in a large team competition appears rather blinkered, but the reality of this event is that it only really gets interesting when the big boys square up from the quarter finals onwards. That doesn't mean that the early rounds haven't yielded upsets: the Netherlands and India have already progressed further than predicted, with home advantage for the Indians paying off with a fantastic win over Wales. 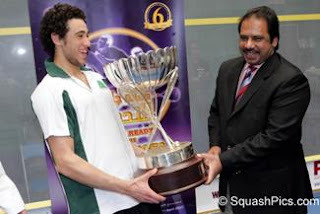 Given the squash heritage of their neighbours and rivals Pakistan (who themselves are relatively weak compared to previous generations), it would be fantastic for the sport if India could go further and raise the popularity of the sport in the country. Reigning title-holders England cannot call on Peter Nicol any more, and their challenge may depend on the strength of the player called upon to take the third rubber in later rounds. The Egyptian favourites - in Shabana, Ashour and Darwish - now possess the strength in depth that means whoever they come up against (either Canada or Australia in the last eight) will have a daunting task deciding who plays who. Hands up who'd refuse a ticket for Ashour v Power? England Squash's new marketing department have launched a new group for squash players and fans on the social networking website Facebook. Billed as a "great way for members, clubs, fans, and anyone who is keen to get involved with squash, to communicate directly with England Squash", the group will also feature news from England's top professionals, "including James Willstrop, Nick Matthew, Tania Bailey, and Vicky Botwright". Members will be able to "discuss the latest news and views through the interactive 'Wall'", as well as keeping in touch with the organisation more effectively. This is a promising initiative from the new marketing set-up at the organisation, showing evidence of a new strategy that looks to embrace the possibilities that new technology provides. 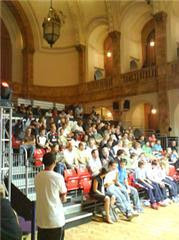 It is also a great way of targeting younger squash players and fans. With 215 members at the time of writing, it appears to already be having some success. The ideal stocking filler for the discerning squash player, The 2007-2012 Outlook for Squash Balls in Greater China is available now. The study "covers the latent demand outlook for squash balls across the regions of Greater China, including provinces, autonomous regions (Guangxi, Nei Mongol, Ningxia, Xinjiang, Xizang - Tibet), municipalities (Beijing, Chongqing, Shanghai, and Tianjin), special administrative regions (Hong Kong and Macau), and Taiwan". Don't even think of stepping on court without reading it. The announcement that Glasgow is to hold the 2014 Commonwealth Games means that Scottish squash should receive a much needed boost. The existing Scotstoun Stadium and Sports Centre will host the men's and women's squash, with investment ploughed into the venue to ensure it meets an acceptable standard. "The existing tennis courts will be transformed into the table tennis arena and new squash courts will be built. This venue is already famous for the atmosphere it generates during competitions, with our planned upgrades, this will only get better." 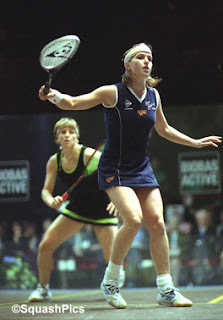 Squash in Scotland has suffered in recent years due to the retirement of players like Martin Heath, Pam Nimmo and Peter Nicol (following his move to England). Scanning the junior events in the news, it also appears that players are not coming through at the same rate as in previous years at junior level. At the European U19 Championships in May, Scotland did not enter any players in the individual events. Scottish Squash do however have their own National Junior Excellence Programme. It will be interesting to see if the prospect of playing in their own country in the Commonwealth Games inspires those who receive funding to emulate the successes of the aforementioned pros. Photo courtesy of Designhive/Glasgow 2014. "I don't think I've ever played better". Amr Shabana has made it three World Open titles in the past five years, beating Frenchman Greg Gaultier in only 42 minutes in the final in Bermuda. Frustratingly for the loser from Epinal, it was the third time that Gaultier had been on the wrong end of a result from Shabana in major finals this season. The 28 year-old from Cairo must now surely receive the plaudits that he deserves, joining the élite handful that have won the World title more than once. The frenzy surrounding the explosion on to the scene of Ramy Ashour seems to have allowed Shabana to quietly rack up the months as the best player in the world, with his compatriot and the rest of the top ten scrapping it out for the runner-up position in most of the big tournaments. Shabana secured his third World title with a relatively easy win over the Frenchman, who perhaps succumbed to the frustration he is prone to. 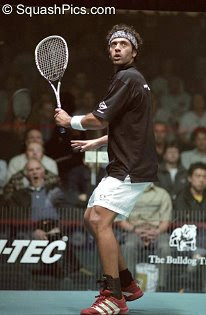 The champion was also quick to praise the organisation of the Bermuda event, claiming that it "should be a model of how every squash tournament should be". I've also watched PSA videos of Shabana talking about the game, it is evident that he is an eloquent guy who has a strong sense of how a professional circuit should be ran. Maybe this is why his profile has bubbled under the radar: the maturity that has led to a greater consistency has meant that a great player has emerged, but this in turn has driven away the more visible (in media terms) but less successful (in squash terms) "personality" that once walked on to court. It now appears that people were too quick to stereotype him in the earlier part of this career as an undisciplined player who was too inconsistent to reach the very top. Things certainly looked this way when I saw him a lose a few years ago to David Palmer in the British Open in Nottingham. However, his considered, sensible opinions on the game and his fellow professionals certainly don't reveal any weakness of mind, and three World titles hardly scream inconsistency. It's just a shame we don't get the chance to see more of him in England. He's overdue the coverage he deserves. 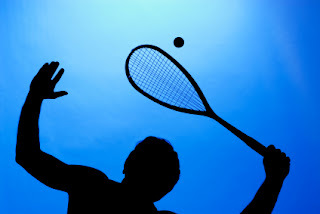 Given the punishing toll squash takes on the body, its inevitable that players will withdraw from tournaments at relatively short notice. Reading the news that Ramy Ashour, Karim Darwish, Borja Golan and Stacey Ross had all had to pull out of the Endurance World Open Bermuda 2007 just before it was about to kick off must have been a real blow for the promoters and the spectators alike. Secure in the world number 2 berth after some big tournment wins this year, the Prince of Egypt/The Special One (any more? Has any squash player acquired more nicknames more quickly?) would have been a sure bet for the final until a leg injury ruled him out. Here's hoping he recovers quickly and will soon appear on British shores (maybe at Canary Wharf?). In his absence, Greg Gaultier and two-time champion David Palmer look best set to challenge Shabana for his crown. "The event will draw extensive media coverage, including presence from Reuters, CNN, BBC World, NBC News, Fox Australia, and Orbit ESPN, and TV coverage is expected to reach up to 2.1 billion spectators worldwide." 2.1 billion?! How is this figure calculated? Shame they won't get to see the world's second best player. Visitors to squashblog may have noticed the lack of movement in the BBC RSS feed at the top of the page. The date in the screengrab to the left appears to say it all - have the BBC abandoned coverage of squash on their website? 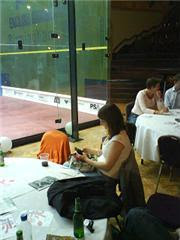 Squashblogger isn't best pleased either. The inclusion of the RSS feed at the top of the page rounded squashblog's design off nicely, and the feed is a lot more customisable than the one provided by the WSF. The BBC site says that it was last updated on the 23rd October 2007. Does the lack of coverage of both World Opens mean that the BBC has decided not to cover the sport any more? It is possible that the recently announced cutbacks at the Beeb may be to blame. Squash promoter internationalSPORTgroup have unveiled a new marketing initiative, designed to retain and increase numbers attending their events. 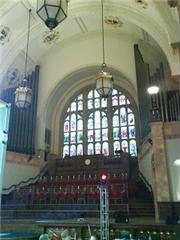 Exclusive membership is £50, and Platinum membership £250. Both represent excellent value for money for the committed squash fan, with the Exclusive membership priced competitively enough to tempt newcomers. This is a brave new step by the iSPORTgroup (who recently put on the English Grand Prix, a slickly-ran affair that was hampered by suspect officiating), and given that squash is crying out for innovative marketing is exactly the kind of initiative it needs. 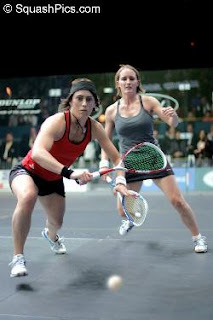 England's Vicky Botwright scored one of the best wins of her career yesterday, defeating the newly-crowned World Champion Rachael Grinham in the quarter final of the Cathay Pacific Hong Kong Open 2007. 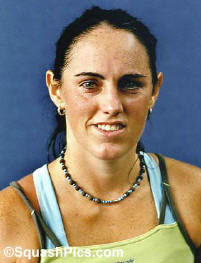 The 30 year-old from Manchester defeated her Australian oppontent 3-1 in just under an hour. The world number 7's career has been consistent over the past three years, with Botwright cementing her position inside the world top 10 (highest position 5). Though rarely troubling the top three of four in major competitions, Botwright has raised her game over the past 18 months, taking the title in Texas and reaching the finals of the Apawamis and Wolverhampton Opens. She now meets Nicol David in the semis. There's a couple of great new marketing initiatives from the PSA and a couple of racket manufacturers up on YouTube. The videos from Tecnifibre and PSA/Dunlop involve a number of PSA pros and are a step forward in the promotion of the sport. A Usual Day with Tecnifibre features stablemates Thierry Lincou and Wael El Hindi "acting out" a supposed day in their training regimes. The main section where they play in the urban surroundings hints at a "street" element to squash. I found this particularly interesting, as it suggests a new direction in moving the game's image away from the stuffy associations that many think it still retains. The film makers could have skipped the first couple of minutes or so where the players are hanging around the conventional court as the dodgy scripting cheapens the concept somewhat. But well done to Lincou and El Hindi for experimenting like this for the good of the game. The PSA film Racket Evolution , which seems to have been put together in partnership with Dunlop, has Frenchman Greg Gaultier and world number one Amr Shabana from Egypt talking about the evolution of squash rackets from the wooden models of yesteryear to today's carbon fibre composite models. The concept is not as innovative as the Tecnifibre film, but production standards are much higher. Both players talk eloquently about the equipment they use - Gaultier recalls a particularly amusing exhibition that he agreed to play "retro" - and the technical jargon usually associated with racket technology is pulled apart by Toby Marcham from Dunlop. The film has been slickly produced by Pro Active Television. 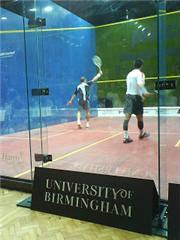 Saturday November 3rd marks the fifth annual World Squash Day. Chief Executive of the World Squash Federation Christian Leighton wants every national association to ask squash clubs to support the day by holding events of their choosing. 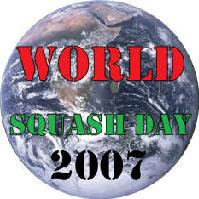 The England Squash website has no mention of World Squash Day. The event was founded in memory of Scottish junior international Derek Sword, who died during the World Trade Center terrorist attacks in 2001. 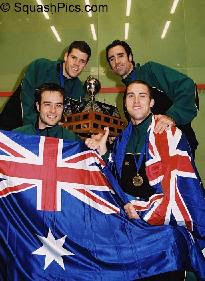 The WSF website lists events that have taken place on previous World Squash Days, including a world rally record, with groups of four playing a non-stop "feed" for an hour, former World Champion Carol Owens taking on some of the All Blacks rugby team, and a group of squash enthusiasts running up a mountain in St. Lucia. 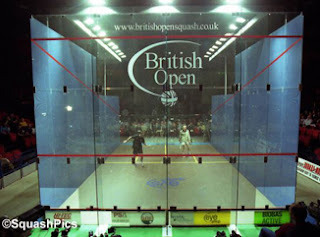 The WSF also hope the scheme can help to raise the profile of squash as it strives for inclusion in the Olympic Games. I am sure the day was advertised better in previous years (I seem to remember some photos of Lee Beachill knocking a ball around a court with Jahangir Khan). Given that the logo above seems to have been given little design thought, it appears that not a huge amount of time has gone into planning the promotion of this year's scheme. This is a real shame, as a once-a-year event such as this should surely receive much wider media coverage. You can show your support by getting your club involved and visiting the WSF website. When I read that PSAlive were to webcast the finals of the British Open 2007 for free, I quickly recovered from my strop at not being able to attend (thanks to Virgin Trains' exhorbitant fares - see this post) and eagerly logged on at 7.45pm. I initially managed to hear some of the commentary, and also managed to log on to the live chat, which is an excellent idea that I didn't know was a feature of the service. Due to the over-running of the women's final, the men's did not start until aroun 8.30pm, and by this time I guessed a few people would have lost patience with the server problems. All credit to the PSAlive team for offering the broadcast for free - a marketing idea that obviously proved too successful due to the terminal volume of traffic that tried to access the match. Hopefully some of the visitors might be tempted to part with a few quid to access live events in the future or download archive matches. 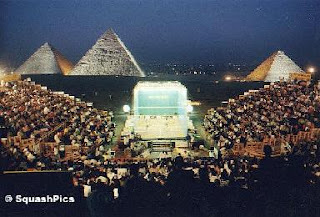 Though the tournament lacked (probably) the best player in the world, it appears that it was very successful, with photos of the crowds at each round showed very encouraging attendance. The progression of the players largely went to seeding, but this Open seemed to save the best till last, with Greg Gaultier's coming of age to take his biggest prize to date and Rachel Grinham's epic win over reigning champion Nicol David to take her third title. 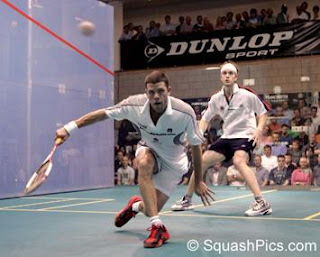 Last week's win for Lee Beachill's in the Wolverhampton Open 2007 could not have come at a better time. The former world number has been out of the top ten rankings for nine months, and the win at the Edgbaston Priory club will surely give him confidence going into the British Open - a title he has never won. Having seen Beachill many times in tournaments, he appears to be a player whose state of mind affects the outcome of his games more often than his physical condition. An excellent mover and one of the best exponents of a good-length game, the 29 year-old from Yorkshire also possesses a cache of attacking shots founded on deception - weapons seemingly at odds with the stereotype of an attritional player. However he never entirely looks like he is enjoying his work on court, with a dogged look on his face that belies a fierce determination. Sometimes the head goes down, but this is rarely followed by the capitulation that this kind of body language displays in other, more emotive, players. More recently he seems to have suffered from a loss in self-belief that has seen him go out of events in earlier rounds. The reasons for this are unclear, though to many squash players with families, constant world travel is a strain and can impact on their motivation - especially when they have been, like Beachill, the best-ranked player in the world. To train and focus on reaching the same heights once more must require a huge mental, as well as physical, effort. 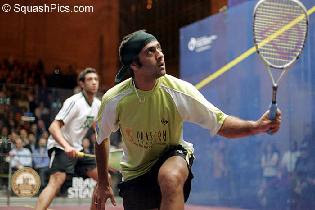 If one particular event sticks in my mind as a point when his confidence must have taken a huge knock, it is the final of the 2006 Super Series. Anthony Rickett's request to change the ball during a game caused chaos, with the officials unsure as to whether this was allowed in the rules. Beachill challenged the request, and was particularly miffed by the lack of guidance available at such an important time in the match. He walked off incensed after losing, clearly unsettled by what had happened. He had the right to feel let down, though it subsequently turned out that his Australian opponent had acted within the letter (if maybe not the spirit) of the Super Series laws. With the top ten in the men's game stronger than ever, Beachill will find it harder to get back up the rankings, especially now that Ramy Ashour has graduated from the juniors and looks set to dominate the senior ranks. Having followed his career, I'd like to see the likable, self-effacing Pontefract man have another (maybe final?) assault on the rankings and be competing in some PSA finals pretty soon. The win in Wolverhampton provides an excellent platform. Very encouraging to read that England Squash's new Chair, Zena Wooldridge, is planning the creation of a Marketing and Communications Team within her organisation. "... the idea is that Club Services would come under Marketing and use part-time external consultants (with experience in leisure and fitness industry) to provide expertise when needed." I would have also liked to have seen "media consultants" included in the parentheses above, but at least this seems that a conscious effort (and the funding to back it up) is being devoted to widening participation by actively "selling" the sport. As I had argued before, innovative marketing and media engagement is needed as much - if not more - than grass roots work.